Howard Hodgkin’s work, at first, appears daringly simple. Yet those splurges, slicks and virulent marks are the results of a mas¬ter manipulator, who goads and entreats the paint into doing his bidding. Hodgkin has always sought to represent personal encounters, emotional experiences and memories of the places he has visited. As a young artist he made portraits of friends and fellow artists, and a per¬sonal style evolved slowly, becoming, in time, a heat-sealed concentra¬tion of image, idea and form. Applied to the conversation pieces he has often painted, talk, setting and personality coalesce and re-emerge in purely pictorial form. 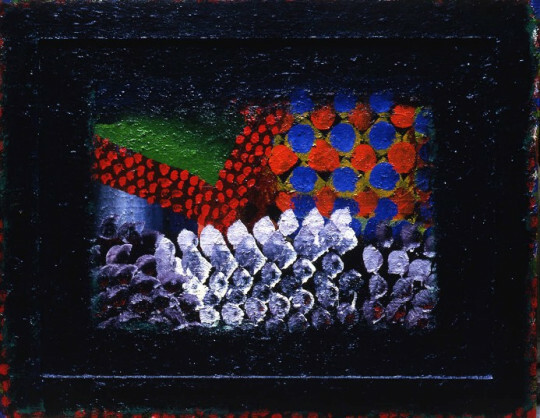 Some of Hodgkin’s style can be traced to his great love of India, a country he not only knows well, but whose art has influ¬enced his own: his interest in non-Western perspective, for example, which gives equal weight and focus to all parts of the picture; the bright¬ness and density of colour; the border and pattern being on equal terms with the subject-matter. The titles of his works have always alluded to his experiences, whether travelling or being in the company of others, and these make for an intriguing narrative, compelling the viewer to search for clues amid the overlapping abstract planes of colour. 1. Hodgkin quoted in Deepak Ananth, ‘Hodgkin’s Poetics’, in Howard Hodgkin: Small Paintings 1975–1989, exh. cat. (London: British Council, 1990), 84.